Atlantis is being invaded by the same aliens that are attacking all of Earth. As the floodgates rise in Atlantis, Atlanteans are transformed into water zombie creatures from the lagoon. Mera is the only one protecting the city. Can She withstand the poisonous invading alien waters? This issue is the direct follow up to the Aquaman Drowned Earth crossover begun in Justice League #10. 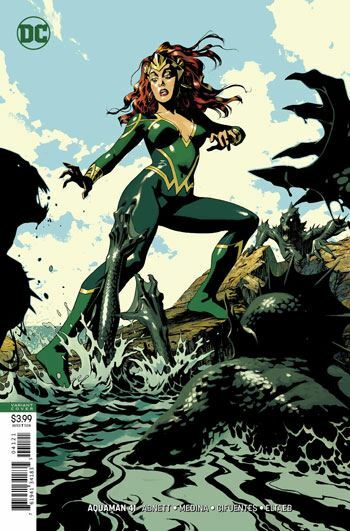 It’s a very good story that again showcases Mera and show her as the rightful defender and queen of Atlantis. I enjoyed how she had to choose to save the world as a Justice Leaguer or save her own people as their queen. 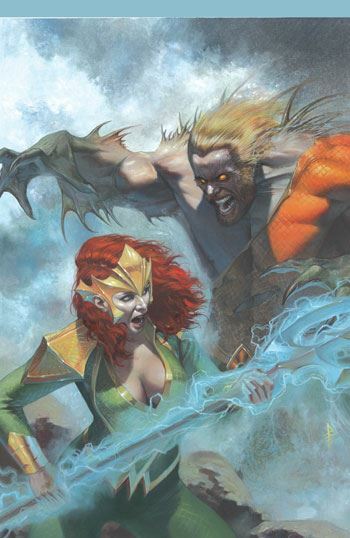 In some sense, even though Aquaman is now free to play Justice Leaguer fulltime, Mera is also caught with the same challenges about whether to devote her energy to Atlantis or the world above. The more things change, the more they say the same! I like this storyline but it’s hard to understand how that fits in the bigger DC universe. You mean that everything was flooded for a few days, that everyone was changed into a water zombie, and magically, all returned to normal? This, of course, is an issue better argued in the pages of the Drowned Earth comic series. Lan Medina was the artists on the Mera comic book series. I like seeing him here too as it ads to the continuity of the visual storytelling. His art infused with inks by Vicente Cifuentes is tight, clean, and beautiful, although I’m not always a fan of how he draws Mera’s face. Those are just personal quibbles.